A few years back when I use to live on the rez, my whole family spent the night at my grandmother's house out in the country. She didn't have running water or electricity, so we had to take care of our business before it got dark. It was about 10:00pm when the dogs started barking like crazy. No one got up to check because it was pitch black outside. The dogs ran back and forth chasing something. Then whatever it was jumped on the side of my grandmother's house and started crawling like "spiderman" around the house. My grandmother had chicken wire on her home because they were going to have it stuccoed. I have shared scary stories here before, but this is a rather creepy story that my grandma shared recently that might be interesting to you. She told it in Navajo, although she knows English. I think maybe it was easier for her to explain it. It was about her older sister, my other grandma, when she was alive and still living at the mountain. We’re on the New Mexico side of the Navajo reservation. My older grandma was living alone in her one-room house, a traditional Navajo hogan. She still owned a lot of sheep and goats and was in good health; she never became senile and was energetic and alert until her death from cancer a few years ago. Her hogan was traditional, so it had a dirt floor with a stove in the middle of the room with the pipe reaching through a large circular opening in the ceiling, with no indoor plumbing. She didn’t have any electricity or even outdoor lighting. The area is surrounded by thick sage brush, juniper, and pine trees, as well as beautiful red cliffs that yield red dirt. One night she went to bed after a long day of herding sheep. She awoke to the sound of somebody walking and moving around on the roof in the middle of the night. Unnerved, but a bit irritated, she asked (in Navajo) whoever it was to state their business. The voice turned out to be a man’s voice. “Wake up!” he yelled in Navajo. My grandma then told him to get off her roof and leave her alone. Surprisingly, he listened to her and jumped off the roof, running in a southern direction as he did so. When she woke up the next morning, my grandma went outside to search for the mysterious footprints in the reddish dirt, but there were none at all. 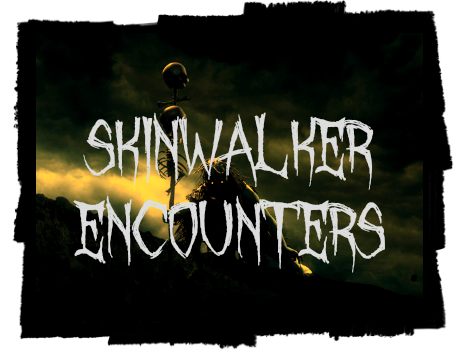 She supposed it was a skinwalker that had visited her during the night. Trust me, it was not the only encounter she had with these types. Other people experienced them as well. I'm sure you'll hear of these stories elsewhere. - Christy H.
Navajos growing up all their lives on the reservation hear about skinwalkers from time to time. For this reason, nearly everyone is cautious about who they trust, or what kinds of things they talk about, because yeenaadlooshiis are dangerous people that have the abilities of animals, yet retain their cunning human minds. My mother has many tales to tell of yeenaadlooshiis (skinwalkers). She tells us because she wants us to be aware that there are people out there that may want to hurt us, or play with our minds. She sometimes tells it to assure me that there is a God, and He watches over everyone, even little Navajo children. This true story, which happened around the 1960s, is one of them. One night, she and her four sisters (my aunts) were at home after a long day of shepherding and doing chores. My mom and her sister needed to use the bathroom before going to bed, and so they decided to go to the outhouse together. (They didn't have plumbing back then, or running water, as they were living in a traditional hogan.) The outhouse was far away, and they didn't want to walk there alone in the darkness, so they decided to go together. It was relatively late. The sole light source was moonlight. As the two finally neared the outhouse, they thought they heard some faint sounds like that of whistling. It was birdlike, but whoever was whistling was following them and was circling the area. They clung to each other, chilled by the sound, and continued on. Oddly enough, the outhouse door was open. Usually when people use the outhouse, they always latch or wire the door shut. As they came close enough to the outhouse, they saw a large black "thing" sitting inside. Though they couldn't see its features, they could make out that it was human in nature. Terrified, they screamed in horror, and ran back to the hogan as fast as their legs could carry them. They could hear someone chasing them from behind, and that it was gaining on them. As soon as they reached the hogan, they dashed in and slammed the door. They hurriedly told their other sisters what happened, and they sat in silence, waiting for something to happen. The hogan door wasn't secure. It was only an old, worn-down door with no knob; it had a rickety latch nailed to the inside of the door to keep it closed. Nothing was barring the smoke hole where the chimney rose out; it was open to the air and you could see the night sky. The person outside began banging on the walls, making all five of them huddle in the middle of the room near the stove. There were heavy objects being thrown now, and a lot of noise. Soon, they heard it climb onto the roof. Whoever it was, was walking back and forth, and every now and then, it would peer through the smoke hole at them, its face hidden by darkness. There were adults present, but being a rather rude foster family with kids of their own, they lived in another hogan some distance away. Though they tried calling out to them, they became angry and didn't answer. Finally, in pure desperation, my mom's three older sisters, being raised Catholic in boarding school, told her and her younger sister to get down on their knees. They began praying to God for protection. One of them had acquired holy water from the church, and she sprinkled it near the door. All night, the skinwalker would circle the hogan, pound on the door, and make that whistling noise, but even though the hogan was improperly secured, that skinwalker never got to break in and hurt them. I live in Oklahoma, but I'm from Gallup, New Mexico. My son Anthony and daughter Alicia had just moved here in from Gallup. They found a house to rent in the same town I live in. So Anthony and I drove back to Gallup to get their stuff out of storage. It was the beginning of March and was very windy. We pulled a horse trailer behind the pickup. It was empty on the way there. We could only drive 45 to 55 mph without the trailer starting to swing all over the road. So a trip that normally took 11 hours took 17 hours. We were traveling on I-40 west of Albuquerque, N.M. There are several different Indian Reservations there. It was late at night and Anthony was driving. He needed to go to the bathroom. So he exited at the bottom of Nine Mile Hill, just west of Albuquerque. He drove behind the gas station because it was closed and there were a few semis parked in front. I told him not to stop there because I saw someone by the trash dumpster. He pulled up a little further and we looked back. There was no one there. I figured that I was tired and was just seeing things. He started to get out and I told him to hurry, that something didn't feel right. He agreed with me. After he got back in the truck, he said it felt like someone was standing behind him while he was taking a piss. He was afraid to look back, so he ran fast and jumped in the truck. My son started driving west again on I-40. Maybe 10 more miles down the road, he started slowing down in the middle of the road. There was a vehicle quite a distance in front of us. We could see the brake lights, and the car looked as if it were turned sideways in the middle of the road. I looked at my son and asked him what he was doing. He said, "Do you see that car?" I looked again and it was driving perfectly down the road like it had never stopped. I told my son to pull over to the side of the road. I asked him if he was tired and he replied, yes. So we both got out of the truck to switch places. I walked around the front of the truck and Anthony walked around the back and stepped over the tongue of the trailer. Right when I was getting in on the driver's side, a car passed by. I glanced at it as it drove by. At the end of the car on the pavement, right by the tail lights, was a man. He was hunched over on all fours, feet and hands on the ground. He was covered with a buckskin. It almost looked as if he had jumped off the back of that car right as it passed us. The next second he was gone. I thought I had to be seeing things. It was late and I was really tired. My son got in on the other side and I started driving down the road. I didn't say anything about what I saw. I glanced in my rear view mirror to see if the trailer was keeping steady. I didn't want it to get out of control. When I glanced back, I noticed something flapping in the wind off of the trailer. It looked as if it were the bottom of a jacket or maybe the bottom of the buckskin I saw draped over the man in the road. Then I asked Anthony if he had seen the man in the road behind that car. He said yes and explained what he saw. It was exactly what I had seen. Then he asked me if I had seen a man leaning against the back of the trailer. I said no, that I hadn't looked in the mirror on that side. Anthony said that when he was getting in on the passenger side, he had glanced at the back of the trailer and saw a man leaning against it. He said his face was hidden but he could see blue glowing around his face. He described it as the color of blue that you see light up on a cell phone. I then told Anthony that there was something on the back of the trailer or maybe even on the tongue of the trailer. Anthony eventually fell asleep. I kept paying attention to the rear view mirror instead of the road. In the mirror I could see a shadow of three stick-like fingers. At one point I almost missed a curve in the road. It was a good thing that I was driving slowly, because there was a good 100-yard drop-off on that curve. We made it to Gallup around 3:00 or 4:00 a.m. I woke up my son to go unlock the gate at his dad's house. When I opened the door, the cab light came on. It was flickering as if someone was moving their hand back and forth underneath it. Anthony saw it too. I lifted the seat to get our stuff out of the back. I noticed that the seat was down in the extended part of the cab. When we left on our trip, the seat was up and can't be put down unless someone is releasing a lever from both sides of the pickup. I shouted at Anthony to come back to the truck to witness the seat. I kind of felt like I was going crazy. We went in the house and went to bed.